Please be sure and explore the 3D Visualization FAQ section for more information on how the details of the visualizations were determined. We hope that these images increase your interest and curiosity about this location and the people of Nodena – who may have been the ancestors of the modern Quapaw. Our ideal goal would be to create an image, that if given to a Nodena Villager would have them say “yes — that is what it looked like.” Of course this goal is impossible but it is an ideal that we keep in mind. Nodena was the home for many people and we hope that these images can begin to provide a sense of the richness and complexity of their lives and engage your interest to learn more about the creators of the amazing objects in the Virtual Hampson Museum. Please note: These images are the result of a first phase in the work and will be expanded and improved during the next phase from June 2008 to July 2009. We will be adding considerably more “detail” to the images in this process. We invite your suggestions and comments on the current versions. This is fantastic work. I’ve been trying to develop a completely on-line intro-to-archaeology course, and the Hampson Museum site is definately going to feature!! 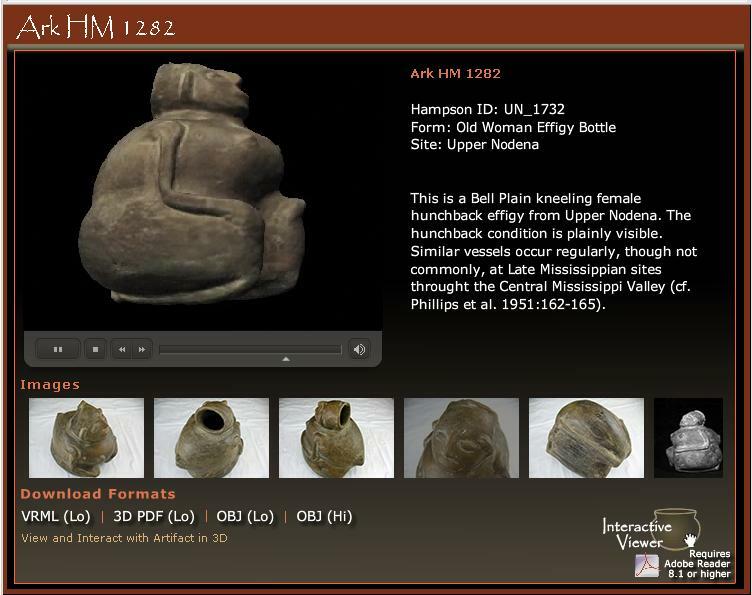 What’s more, using point-data generated from laser-scanning, 3d models of artefacts are also available for study and download from the site (in a variety of formats). This neatly solves one problem for my online students, of how do you make online teaching hands-on? Previous PostDigital Media and Learning Competition: a digital archaeology moment?